Steven (Chicagoland, United States) on 23 September 2014 in Architecture and Portfolio. 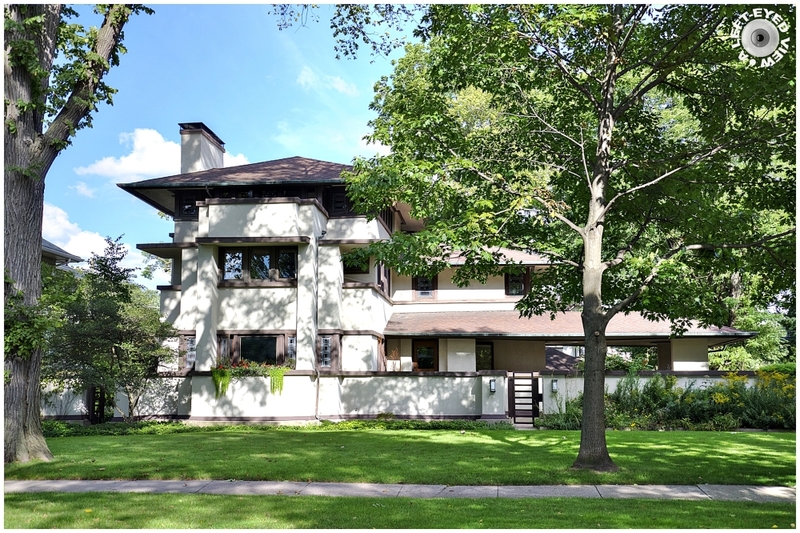 The William Martin House is an early Prairie Style Frank Lloyd Wright home completed in 1903. Here, there is a struggle between the vertical and horizontal elements of the home where the two story, outer columns thrust the building upward. However, this is balanced by the long, overhanging roof eaves that step down from the top to bottom of the William Martin House. The house maintains many of the other Prairie Style qualities developed by Frank Lloyd Wright: it rests on a concrete stylobate; it is covered in stucco; it has horizontal wood banding; it has banded art glass windows. This would be the last time that Frank Lloyd Wright used vertical elements in his homes. The relationship between William Martin and Frank Lloyd Wright was a very fruitful one for Wright. The making of the William Martin House would lead to the commission for the EZ Polish Factory in Chicago, as well as the building of the Darwin Martin House in Buffalo, New York, and the Larkin Administration Building in Buffalo, New York. Nice architecture (of course, by F.L.Wright). Good framing. I can feel The Master struggling with this one . . but no-one said it was easy ! Good design and distribution of outdoor spaces. i like the harmonious dimensions in this attractive building! nicely framed again ! Yes, a harmony to these elements and lines. Beautiful streetscape you capture here as well. It looks just as good today as when it was built. What a grand looking home. It looks great today and well kept. Excellent image where the building shows its characteristics. First, I didn't know so many of Frank Lloyd Wright's houses still exist. Second, it's really cool to see his style developing. Third, I'm really glad you took these gorgeous photos. I like this view - it shows off the tapering stories in this architecture. Gorgeous image as usual. with beautiful frame, colors, lighting & shadows! Superbe maison et image dans la belle végétation splendide. FLW houses are just so beautiful. Interesting history ... I like the balance of the horizontal and vertical lines here.